Michelle, that Italian Mama Chef did an awesome job of hosting Presto Pasta Night Roundup #152 Thanks so much, you're amazing. And everyone who sent in your mouth-watering dishes....Presto Pasta Nights would be nothing without you. It's hard to believe that PPN is actually going to be three years old next week. I started it as a lark, hoping I wouldn't be the only one contributing...and it just gets bigger and better every week. I do hope you all plan on joining in the big celebration. Send all your dishes and tell your friends to send theirs too. 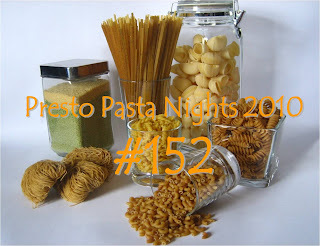 Just mention Presto Pasta Nights with a link and send it to me ruth (at) 4everykitchen (dot) com by Thursday and let's make this the biggest birthday bash ever. Three years Rith that really is a momentous occasion!!!! I was thinking of joining you....it is PPN birthday party. I must! Looking forward to seeing both of your at the party! We have them every week...so we'd love to have you join the fun. Just check the sidebar to see who's hosting which week and the simple guidelines to follow.